Choose from EBC plain non drilled rotors or sport rotors in two choices – wide aperture GD Sport Rotors series for cooler running or new super silent Ultimax USR slotted rotor series. All EBC rotors including USR Slotted Rotors are British made and are precision machined in the UK. Rotors are made from high quality grey iron to exacting standards and undergo extensive testing and rigorous quality control. 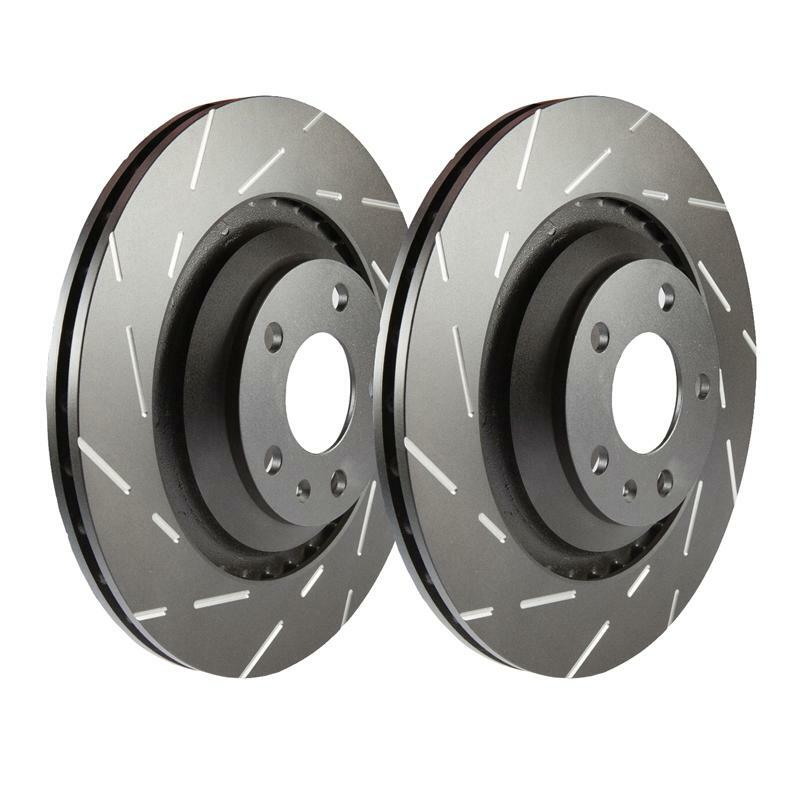 Slotted rotors can significantly improve brake performance and longevity when used with a matching high friction brake pad set. Having sold hundreds of thousands of brake kits EBC Brakes feel confident their approach is as perfect as it gets. We are of the opinion that slotted rotors have been “Over sold” by certain marketplace participants and our findings are that a slotted rotor will only give benefits if used with a pad that compensates for its reduced surface area. EBC brakes now produces all of its GD series and USR discs with a new ,long lasting corrosion resistant finish. The coating is either the world famous GEOMET or for less popular smaller batch items we use the new NITROTHERM process of anti corrosive paint applied using this revolutionary process that coats with warm Nitrogen producing a better finish. During 2014 the former GOLD series GD discs will be phased out. EBC recommend the use of a premium pad such as Redstuff brake pads or Yellowstuff brake pads to complement your new USR slotted rotors which will provide the optimum balance of life and performance. All EBC sport rotors are final machined in the UK and many of the castings used in EBC rotors are also UK made. In manufacture the EBC rotors are 100% runout inspected to a maximum of 0.1 mm total indiocator reading or 0.004 inches and should be runout checked after install on your car. If your car develops brake vibration after 3000-4000 miles this will be due entirely to a runout issue which happens on one in seven road vehicles. Most OEM builders Pro Cut turn rotors from new at install to avoid this problem and EBC reccomends highly the Pro Cut on car brake lathes at your disc install.